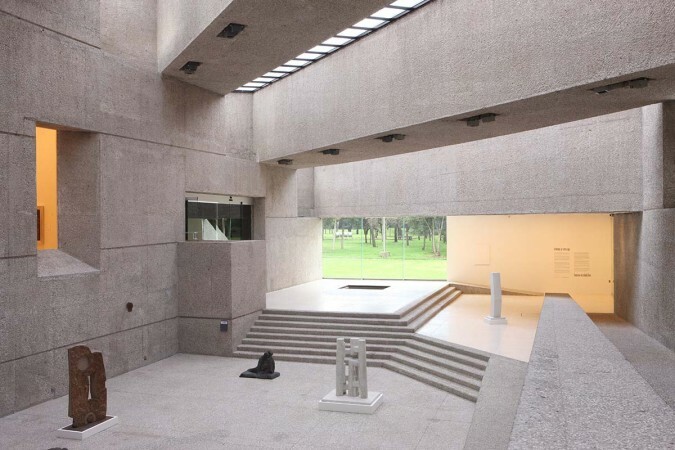 Especially conceived for the Museo Tamayo, El día del ojo was a new work by Pierre Huyghe entailing research, travel and chance encounters across Mexico. To create this work, the artist sited natural phenomena and cultural manifestations that likely go unseen or that are invisible to the eye. The exhibition title refers to a designated day for the warranted observance of the eye or, possibly, simply, of observing. In the context of Huyghe’s project, the title also suggests looking at the predicaments arising with eye witnessing. The artist’s work is an indoor pool-like structure inhabited by live blind-cave fish and by floating volcanic rocks. It was constructed onsite, underneath the museum floor, just at the margins of its central sculpture patio. Within that quasi-natural, quasi-artificial environment underground, these species were left on their own, without any other being bearing witness to them. El día del ojo, which is made visible or invisible at the museum according to rituals defined by the artist, was uncovered at the exhibition opening. It now remains closed until future yet undefined protocols create its reappearance. Accompanying El día del ojo was a display of artifacts and sculptures made of natural minerals and drawn from the collections of Museo Tamayo in Mexico City and the Museo de Arte Prehispánico in Oaxaca City, both institutions founded by the artist Rufino Tamayo. With the intent to diffuse time periods, these pieces were presented without information labels. And they were arranged in space considering a natural-clock: their position in the sculpture patio was determined by the sunlight radiating through the building skylights and cast on its grounds at specific hours. This presentation display calls on an exhibition that Huyghe experienced in 1987, on his first visit to the country and the Museo Tamayo. However, it was far from a reconstruction of the original exhibition the artist witnessed, which happened to be of Tamayo's sculptures, and that he actually captured others seeing with this own film camera twenty-five years ago. Instead, the display of El día del ojo was an attempt to reverse the condition of encounter: from exhibiting something to being exposed to something. One more component in a multiple set of operations that constitute El día del ojo is a publication on Huyghe’s journeys and encounters in Mexico. Neither a visual essay nor a travelogue, it includes a text preceded by images of the Museo Tamayo’s 1987 exhibition drawn from the artist’s personal film-reels, pictures from the artist’s journey to the Naica Caves in northern Chihuahua, and several other points of interest that were unearthed from caves to archives to artifacts in the process of creating this work. Huyghe’s El día del ojo—the work, the presentation, and the publication—attempted to either expand or constrict the sense of time between what exists in itself and what appears to the eye. In doing so, it was an invitation to reconsider the spaces of interpretation that reminiscences and oblivion create as the place of the unknown. In between all that, the figure of the witness was observed.